As a reminder, be careful with your sources for raw EYBL statistics. There are known and voluminous errors on the D1 Circuit website – their statistical information and reports are often wrong. If you lookup stats on their website or get your stats from someone quoting them, it’s a good idea to double check (e.g., on NikeEYB.com and/or GameChanger.com). 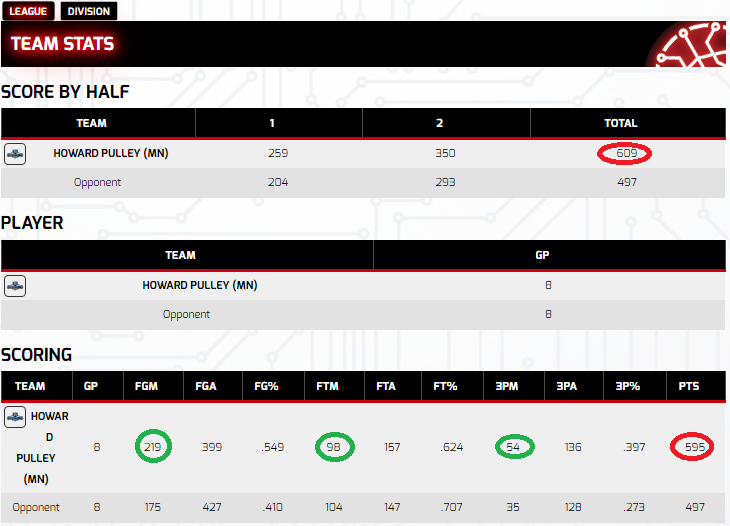 A quick example as of today (screen shot below) is regarding total points for Pulley this season. On two rows in a single D1 Circuit screen, there are essentially three different season-to-date point totals for Pulley that D1 Circuit is reporting. The two red highlighted items show 609 points and 595 points, respectively. Further, if you calculate based on the information in the green circles (e.g., 2 points for a 2FGM, 3 for a 3FGM and 1 for a FTM), the data calculates out to 590 points.